I’ll be frank, you’re not skinny because of your genetics or your metabolism, you’re skinny because you’re not consistently eating enough damn calories! You see, the one variable that determines whether or not we’re gaining weight is energy balance; the relationship between “energy in” (food calories taken into the body) and “energy out” (calories being burned in the body for energy). If you want to gain weight your goal is actually quite simple: eat more calories than you burn. But you probably already know that, don’t you? I’m willing to bet that you already have a pretty good idea of how many calories you need, too (if you don’t, read this). Why aren’t you able to gain weight then? I’ll tell you why… it’s because knowing what you have to do is only half the battle, the other half is actually doing the work. For instance, you’ve created a budget because you know you have to save money, but you’re still opting for those new Jordan’s rather than throwing that $200 into your savings account. Similarly, you have a calorie goal for the day, but you’re just not reaching it on a consistent basis. Depending on how large of a calorie surplus you’re aiming for, under-eating just one day out of the week could be the difference between gaining and maintaining (or even losing) weight. I get it, though. For guy’s like us who are used to consuming 1500 calories on a good day, doubling the amount of food we consume from one day to the next isn’t easy; our appetites aren’t trained to handle that much food. 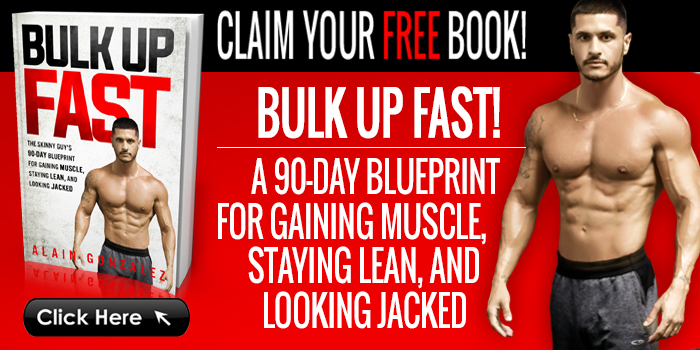 And although there are a few different strategies you can follow in order to increase your appetite, there is one “trick” that will solve this issue for most skinny guys. A study published in the Journal of the American Dietetic Association compared the appetitive response from solid foods (apple), semisolid foods (apple sauce), and liquid calories (apple juice). Researchers found that liquid calories elicit the weakest appetitive response. Want to get a ton of calories in without feeling too full to eat later? Make it a habit to include at least one homemade weight gain shake into your day! Although these weight gain shakes wouldn’t be considered liquid—they’d be considered semisolid—semisolid food produced a weaker appetitive response than solid food. Taking all of those ingredients, blending them into a shake, and chugging it in one shot. If you chose the former, you’re more likely to (1) spend a good deal of time at the table, and (2) feel full for a longer period of time. If, on the other hand, you chose the latter, you’d (1) spend less time consuming those calories—heck, you could even take them to-go—and (2) you’ll probably be hungry again soon. Include these homemade weight gain shakes to your diet! The directions for each shake (or smoothie) recipe are quite simple. For a shake, simply throw all ingredients into a blender (add water to adjust consistency as needed), blend them up, and enjoy! If you’d prefer a cold smoothie, simply add 3-5 ice cubes to the mix and voila! Anticipating a busy day? Double up on all ingredients and have one shake now and the other later. This’ll take care of over 1500 of your daily calories (118P/186C/34F). Want to add more calories? Simply add a few tablespoons of Strawberry Jam! If you want to kick this bad boy up a notch, add another ½ cup of raisins and/or another tablespoon of almond butter. Add an extra tablespoon of peanut butter and get closer to 1000 calories! This is hands-down one of my favorite weight gain shake recipes. Do yourself a favor, don’t change the ingredients or serving sizes—this one is perfect just the way it is. With over 900 calories, this is another recipe I wouldn’t change. Most guys aren’t losing weight, they’re maintaining it. This means that reaching a calorie surplus could be as simple as adding an extra 250kcal to your daily intake. With close to 950kcal, I think you’ll have no trouble reaching your calorie goals if you added this shake to your diet. There you have it, 7 homemade weight gain shake recipes that’ll make gaining weight and building muscle far easier. Whether you’re short on time, struggling with appetite, or both, these weight gain shake recipes are a life saver!